Blue Voyage Turkey – Comprising of dozens of different breathtaking itineraries which take place along the turquoise coast of Southern Turkey is the world renown Turkish blue voyage. This original holiday concept starts from Bodrum and stretches as far as Kalkan. You will be witness to stunning natural beauty combined with timeless history, picturesque coves, charming towns, and villages. It is possible to enjoy a highly fulfilling vacation that will offer you and your blue voyage guests so much in the Aegean and Mediterranean seas. Custom tailored, a blue voyage is available at different levels of luxury for holidaymakers and based on their criteria. It is where you travel on board a Turkish gulet – handcrafted wooden yachts mainly constructed with ketch rigging. The blue voyage isn’t limited to Turkey. It expands from the shores of Turkey out to the Greek islands in the Dodecanese and Cyclades. The main ports of embarkation and disembarkation include Bodrum, Marmaris, Gocek, and Fethiye. Sometimes some gulets can start from Kalkan – depending on their charter schedule. 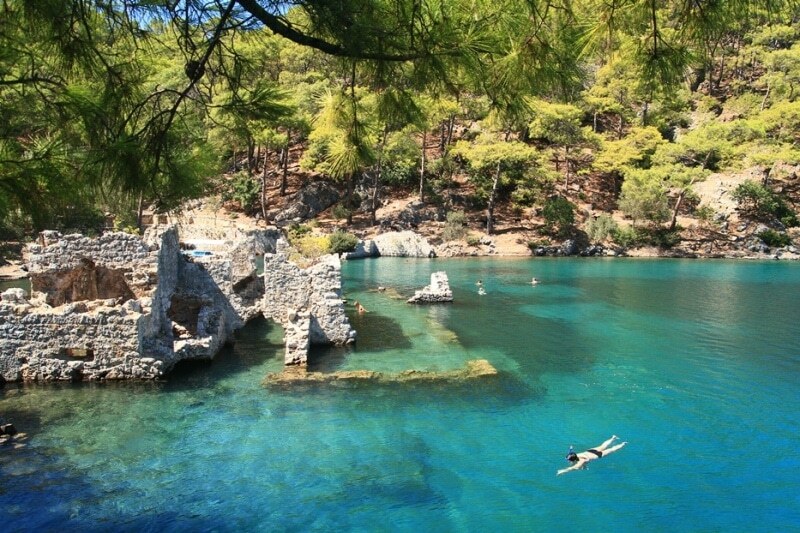 You can do island hopping in Greece by starting and ending in either Bodrum or Marmaris. These two ports are the closest to the Greek islands. Gocek and Fethiye fall too far out. Although it may be possible as well. Indulge in 100% Mediterranean and Aegean cuisine, fresh, plentiful, and very healthy. It is possible to discover all the hidden beauty and undiscovered places of the Turkish Mediterranean on a priviledged blue voyage holiday. It is also possible to live a totally different holiday style with your loved ones in far out places not seen by many. Itineraries include historical sites, lively ports, serene bays, private coves, villages, towns, islands, and more in your route. The Blue Voyage also adresses the palet during the best sunsets with fresh and tasty fish, meat, chicken, and vegetable menus, colorful Turkish mezes, filled with peace or a lively night – your choice. Depending on the gulet you hire, take pleasure in many different types of activities. From swimming, snorkeling, fishing, kayaking, paddleboarding, wakeboarding, windsufing, water skiing, jet skiing, and so much more. And if you’re not up to being in the water, there are always choices in board/card games on board. Depending on the itinerary you choose, some of the historical sites you can visit on your gulet voyage are Knidos, Kaya Koy, Dalyan mud baths, Caunos, Patara, Marmaris castle, Bodrum castle, Telmessos, Bozukkale, Manastir Bay, Batik Hamam, Bedri Rahmi Bay to name a few. Away from the city life, even for a week, perhaps longer, point your compass to the Turkish Mediterranean and take course on a magical and unforgettable blue cruise holiday where blue meets the green, aboard an authentic Turkish gulet.